Members who wish to stay on site overnight must advise the Office administrator at least 24 hours of doing so, and book into the office upon arrival on site. 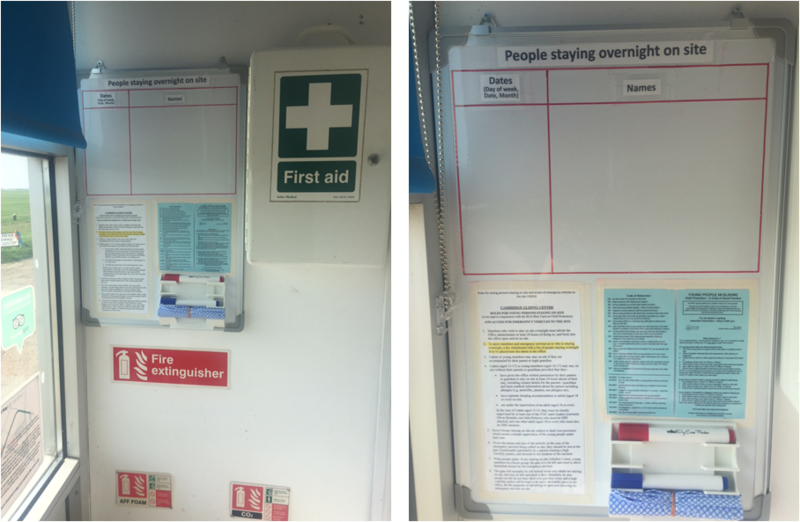 To assist members and emergency services as to who is staying overnight, a dry whiteboard with a list of people staying overnight is to be placed near the alarm in the office. Cadets or young members may stay on site if they are accompanied by their parent or legal guardian. are under the supervision of an adult (aged 18 or over). In the case of Cadets aged 13-15, they must be closely supervised by at least one of the CGC cadet leaders (currently Oliver Bosanko and Julia Robson) who must be DBS checked, and one other adult (aged 18 or over) who must also be DBS checked. Scout Groups staying on site are subject to their own processes which ensure constant supervision of the young people under their care. Given the nature and size of the airfield, in the case of the emergency services being called on site, they should be met at the gate if practicable (preferably by a person wearing a high visibility jacket), and directed to the location of the incident. When people under 18 are staying on site (whether Cadets, young members or a Scout group) the gate is to be left unlocked to allow immediate access by the emergency services. The gate will normally be left locked when only adults are staying on site, but may be left unlocked at their discretion. In case people on site do not have their own gate key. a key and a high visibility jacket will be kept in an easily accessible place in the office, for the purposes of unlocking the gate and directing the emergency services on site.